Last week we talked about letting go in conjunction with the new moon and the beginning of a new year. And we used the analogy of how trees let go of their leaves fully and completely, which enables them to grow and bud and create new leaves. But that's not all that happens when a tree sheds its leaves. It also reveals things that lay hidden beneath the leaves. 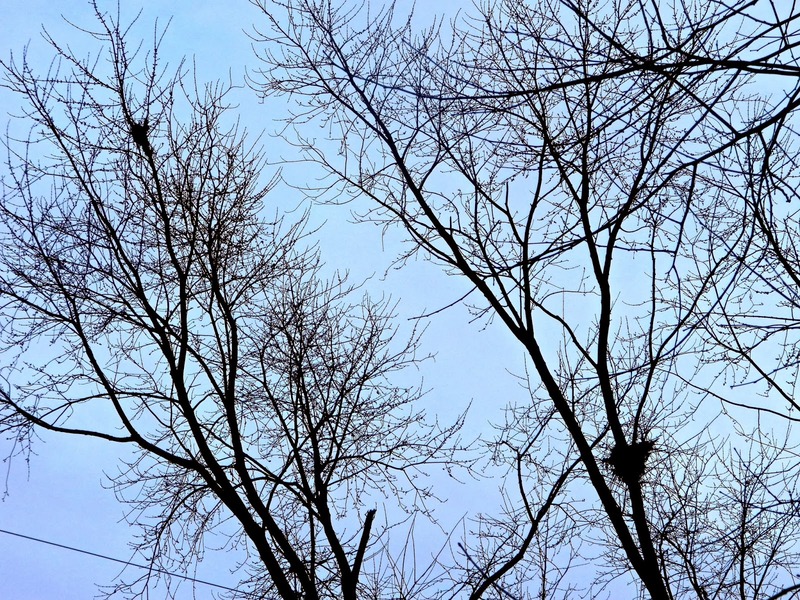 Like the two nests in my neighbor's tree. You don't get a full picture of the situation until the clutter is gone. And it's that way with us, too. Letting go reveals things that are hard to see while you're still holding on. One of the paths of Buddhism is cultivating a detached mind. I'm not a Buddhist, but detachment is a powerful state. As philosopher and mystic Simone Weil observed, “attachment is the great fabricator of illusions; reality can be obtained only by someone who is detached.” And that pretty much encapsulates the point of today's post. Without the leaves, we can better see the reality of the tree. Without our attachments, we can better see the reality of our lives. Attachment is nothing more than holding on...holding on to anger, hurt, love, desire—you name it. There is no objectivity, no reality, through the eyes of emotion. Our emotions bias us greatly. But it would be a mistake to think that detachment is walking through life without emotion. Rather it's not being attached to your emotions. It's about separating yourself from your thoughts, emotions and biases so they don't color your world. It's about not being ruled by the whims of emotion. You can detach overall—that's the Buddhist path that leads to peace and contentment (aka the end of suffering.) Or you can detach from a situation or person, which is what I really mean to talk about today. Because as long as you're invested in a situation—as long as you're in the head of "right and wrong", "your fault and mine", "fair and unfair", "happy or sad" etc.—you can't see the truth of what is going on. You can't be objective. You can only see things through the lens of the emotion or stance you're attached to. Sometimes you catch a glimpse of the truth...or a glimpse of compassion. And that triggers understanding. Which then triggers letting go. But more often than not, it's the other way around. You drive yourself crazy until you have no other option but to let go. And, once detached, you gain understanding. And then the truth is revealed. So while you're telling yourself, "I can't let go until I fully understand what happened and why," its actually more common that you won't understand what happened and why until you let go. It's one of life's little paradoxes. But when you think of how you are when you're all caught up in something—obsessing over it, replaying it over and over, thinking of how you'll handle this eventuality or that, drawing conclusions, feeling angry or hurt, pretending like you don't care—you can see how the mind is occupied with everything but genuine understanding. This mental clutter, like leaves on a tree, hides what is really going on at the core of the situation, the core of you and the core of the other person. In most interpersonal conflict, for example, the reality is that whatever the other person did was not about you at all. You just felt it that way because their drama coincided with a pain or fear or desire deep within you that they weren't aware of or even thinking about at the time. In essence, two pains collided and neither of the two pains even saw or thought about the other pain...like an auto accident where you don't see the other person until you've already hit them. Then all hell breaks loose. Then everyone gets huffy. You go about dealing with the headache of getting things back to the way they were before the accident...with everything in its place so you don't have to worry moving forward. Then time passes and you realize, at the heart of it, it was only an accident, it wasn't really anyone's fault, it didn't happen just to piss you off and thank god everyone came out of it alive. Whether it's conflict or sorrow or love or romance that happened to you, it was just a collision...something that came to wake you up and shake you up in some area of your life. And, like with the cars, you'll never get back to exactly where you were before the collision. There may be a new and different feel to your vehicle. But unlike with the cars, the transformation that came from the collision is your divine reward. And like the nests in the trees, you can't see that until all your leaves—all the dead skin cells of the injury caused by the collision—have dropped and exposed the beautiful, life-supporting gems beneath. Thanks you writing this. I need to find compassion where I cannot empathize anymore I have to let go of my part of the drama in order to heal. Yes! As long as we stay stuck in the drama, we can't heal!